When Malcolm Gladwell was asked what one thing would most improve education he replied, ’Abolishing teacher staff rooms’. He may have been right – a survey published today shows that teachers top the worst ‘gossips at work’ poll, with 79% talking about their colleagues behind their back. Financial services staff were second and those who worked in catering third. The survey of 2000 workers was conducted by ICBI. No other professions have a ‘panic room’ just for managers to chill out, so why have school staff rooms? Surely that’s exactly the time when students are at their most vulnerable in terms of bullying? I have similar problems with the entire student body having to stand up every hour and march off to another location in the school. Imagine a company asking its employees to move to another department on the hour, every hour. I agree with a lot of what you say about schools, but I can't agree with this take on staff rooms. 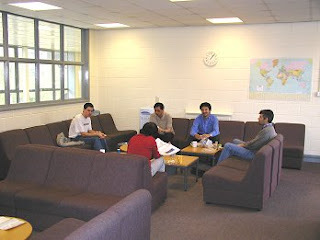 They aren't a panic room, but a place for meetings, lesson preparation and having a cuppa in quiet. How many organisations have meeting rooms, desk space and informal kitchens? Quite a few. "the inexplicable absence of conversation about children among the teachers...to this day, after thirty years in the business, I can honestly say I have never once heard an extended conversation about children or about teaching theory in any teachers' room I've been in"
see also his 'The Underground History of American Education' and 'A Different kind of Teacher'. Ha. You've clearly never been a teacher in a public school. While I can agree with Mr. Gatto on nearly all of his ideas and applaud him, I think you've missed the point. Teaching, in it's present form, can be a maddening job, far be it for me or you (or anyone) to deny those poor people a break from their students where they can talk about whatever they please without being accosted.